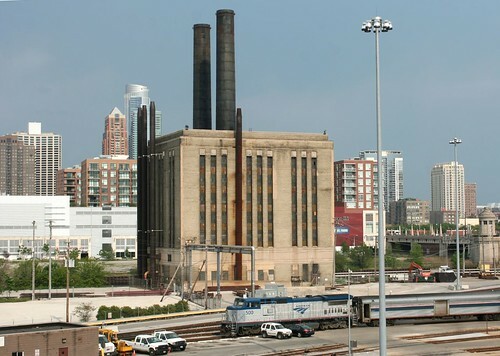 The Union Station plant was built to provide power not only to the train station but also to the new (now old) Post Office, both owned by the Chicago Union Station Company. It was advertised as a “smokeless” power plant, using newly refined techniques to burn coal with a reduced ash output. Architects were Graham, Anderson, Probst and White. Construction of the new power plant was urged along, as its predecessor occupied the future site of the new Post Office, which in turn could not be started until the old power plant was replaced and demolished. 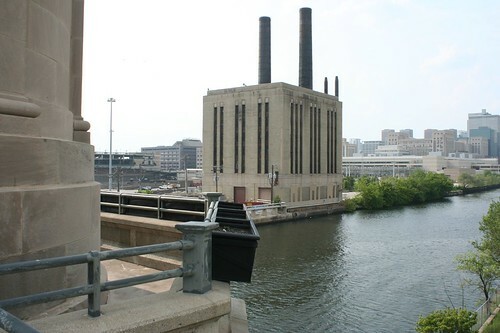 The plant was still operating in 1980 when the company received notice from the city boiler inspections department that it must replace the four boilers. 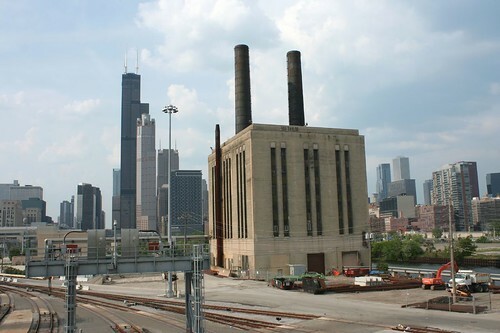 The work was apparently carried out, because the plant was still providing power and steam to local buildings into the 1990s, and – despite its forebidding appearance – still shows some signs of life today. This entry was posted in Art Deco, industry. Bookmark the permalink. I have been enjoying your articles on Peterson Avenue. During the late 1950’s and 1960’s my father was a real estate agent for Berkson and Son’s Real Estate. I remember the office was very modern for the time and was among the buildings you have been hi-lighting. My father doesn’t remember the exact address but he has also been enjoying your articles. Thank you for your very interesting and knowledgeable posts. I’m curious about the address. Taylor Street runs east/west. How can the address be 301 S. Taylor? I for all time emailed this website post page to all my associates, as if like to read it next my contacts will too.